Latest Revolut news (March 2018): Revolut launches Disposable Virtual Cards to tackle online fraud. What has Revolut been doing? This post will keep you up to date on all the innovations, new functionality, interesting partnerships and UX improvements from the challenger bank. Initially launched in 2015 as a money transfer app, Revolut has come a long way in a short amount of time. It has significantly expanded its portfolio of products and has become one of the major players in an increasingly crowded challenger bank market. Originally positioned primarily as a foreign exchange service, the challenger bank boasts free international money transfers and fee-free global spending at the interbank exchange rate. The FinTech has been developing rapidly and we have outlined the most significant updates and announcements in a timeline below. In January, Revolut became the first challenger bank to introduce bill splitting functionality to its app. Customers were now able to split bills using their phone contacts. This was a significant update that truly highlighted the potential benefits of challenger banks such as Revolut as opposed to incumbents. The feature can be used for anything from splitting a restaurant bill to paying the rent. Rival challenger banks such as Monzo and Starling have launched bill-splitting functionality in the following months. Revolut announced the launch of its UK current accounts in February 2017, allowing customers to have their salaries paid into their Revolut accounts. This not only put Revolut ahead of other challengers, as the first to launch a current account, it was a clever move by the company to establish itself as an international FinTech. When newcomers arrive in the UK they are faced with needing proof of address to open a bank account, while simultaneously needing a bank account to rent or buy a home. Revolut aims to solve this problem by making the process of opening a UK current account simple and easy. Customers simply have to verify their account with a selfie and a picture of their passport. 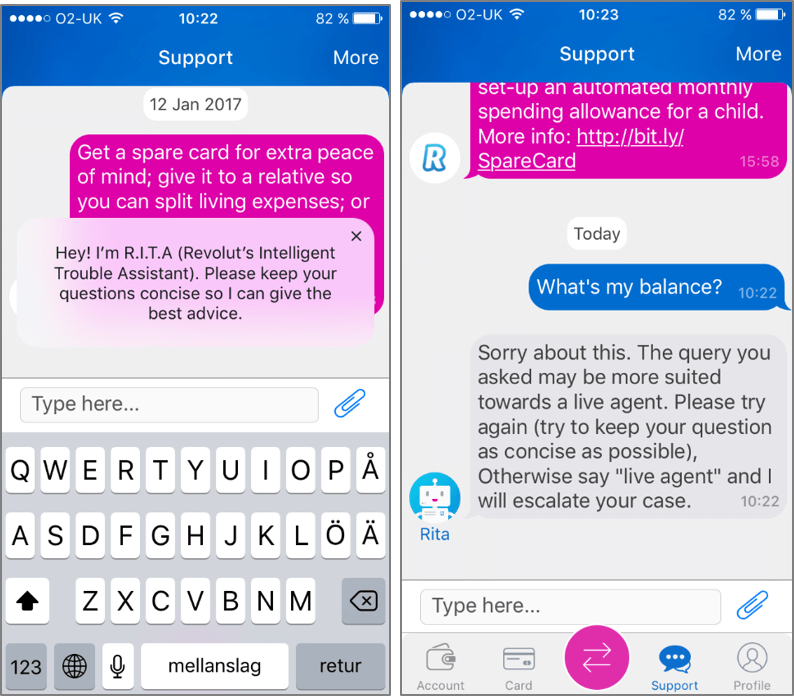 February also saw the roll out of Revolut’s chatbot, RITA (Revolut’s Intelligent Troubleshooting Assistant). 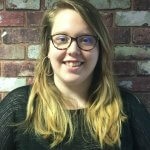 RITA replaced the chat service built into the app and provides users with general help and support. RITA is powered by AI meaning it is learning as it has conversations with customers. If the chatbot can’t help, then the customer gets transferred to a Revolut agent, however Revolut hopes that as the artificial intelligence learns, it will be able to answer nearly any query without having to be transferred to an agent. There were two major developments for the London-based challenger in March, the first being the introduction of credit lines. Revolut partnered with Lending Works to provide credit lines to users through the app. ‘Pay for big purchases in small instalments at half the cost of banks,’ Revolut proclaims, referring to its offer of £500 to £5000 of credit paid back over 12 to 60 months at a representative APR of 9.9%. The feature was added to the profile section of the mobile app (instead of being given a dedicated tab on the main menu). The feature is easy to navigate and can be easily used by customers- in just a few taps, an approval can be given, and the money could be in your Revolut account in minutes. Of course, as this is Revolut, the money can be spent in any currency, without fees. Lending Works is a peer-to-peer lender, so Revolut customers are borrowing from individuals, not from banks, which keeps the rates low. 9.9% may not be the lowest rate out there, but few credit cards can be processed as quickly as this. Mapa Analyst Ross Gallagher comments: “With the appetite for credit among UK consumers rising sharply, challenger providers are looking to break the traditional dominance of the incumbents by offering a superior experience. Experience is important when it comes to applying for credit, and FinTech providers are uniquely positioned to address traditional pain points in the digital journey and capture market share’. Established third-party providers such as PayPal are also offering instant access to credit- already integrated within the digital checkout journey, disruption is minimised. 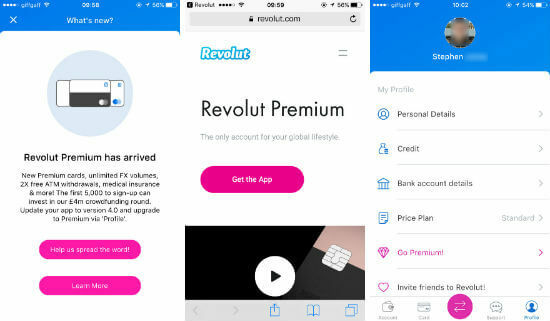 Revolut unveiled another product development in March – Revolut Premium. While continuing to offer a free service to whoever wants it, the challenger added a premium tier, costing £6.99 a month, for users in 42 European countries. The new service, available via the app, was promoted to users via an interstitial and homepage banner, and clearly positioned in the main menu using contrasting colourful text and iconography. The offering also comes with a premium MasterCard, available in a range of colours. The card has a range of benefits for users, such as large ATM withdrawal limits, overseas medical insurance and 24/7 customer support. In April Revolut announced a further partnership, joining forces with online-only mortgage provider and PropTech startup, Trussle. Trussle is backed by Zoopla and uses artificial intelligence to advise people on the right mortgage. Revolut users are able to get access to Trussle’s mortgage broking service, via the home screen of the Revolut app, as well as on-going monitoring that can alert homeowners that they could save by switching to a new deal. Customers can search over 90 lenders and apply online via Trussle, which lets you see what you can borrow in just 60 seconds, and receive a printable Mortgage in Principle in less than five minutes. Revolut users can access the service for free and, as an added incentive to accelerate the partnership, basic Revolut users will receive a £50 reward into their account for each mortgage transaction submitted; Premium Revolut users will receive £125. In June, Revolut announced the launch of its business current account, representing another big step towards offering a full suite of core banking products. The account will be available to customers towards the end of 2017 and customers will be able to choose from three packages with monthly fees ranging from between £25 to £1000. The new service will offer companies access to multi-currency accounts and fee-free international money transfers. Company employees will also be issued with corporate cards, which can be used for international fee-free spending. Real-time spending notifications will also be available. July 2017 saw Revolut secure a whopping $66m investment in a fund-raising round from a number of well-known venture capital firms. It stated that it intends to use the funding to improve business and consumer products and introduce a host of new features. This announcement signals that despite fierce competition from the likes of Monzo, Revolut’s expansion is at no risk of slowing down. Shortly after its successful funding round, Revolut announced the first of its new features: Euro Accounts. Customers are able to receive a unique IBAN that can be generated in-app, which can be used for a salary mandate. This update has allowed customers across 42 countries to gain almost instant access to a digital current account, without needing to go through a credit check or provide proof of address. This new feature reflects Revolut’s popularity throughout Europe and signals its intention to expand and solidify its user base in Europe. Revolut customer can now set up recurring payments through the mobile app. Considered a core feature by our analysts here at Mapa, it can be found under the ‘Payments’ section. Perhaps most notable by its absence from the challenger’s mobile banking app, this feature will surely be welcomed by customers. In December, Revolut announced that users would now be able to buy, hold and exchange cryptocurrencies from within its app. Revolut customers are now able to buy Bitcoin, Litecoin and Ethereum in all 25 base currencies, eliminating foreign transaction fees. Nikolay Storonsky, Revolut’s CEO said: ‘We’re going to open up cryptocurrency exposure to everyone, faster than any other platform on the market.’ As cryptocurrencies move into the mainstream, we can expect to see more digital banks and FinTechs follow Revolut’s lead. 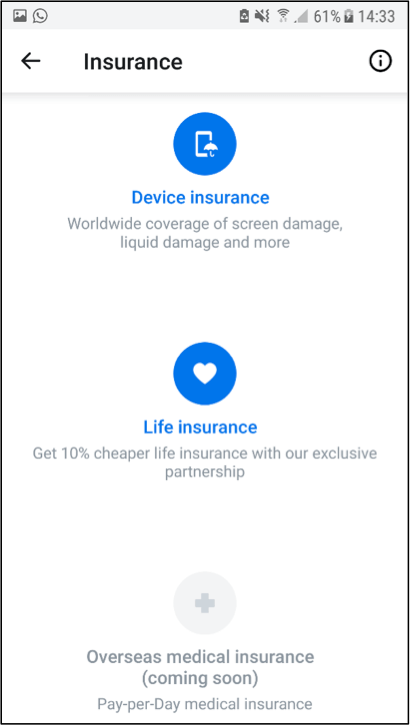 Revolut has continued the expansion of its insurance ‘hub’ with the launch of their medical and dental travel insurance products. They have partnered with Thomas Cook Money (the financial services arm of Thomas Cook Group) to provide a £0.99/day subscription to international medical and dental insurance, in-app. Revolut’s rates are highly competitive, even compared to Thomas Cook Money’s own new digital travel insurance, Roam, which offering a £2/day travel insurance – Revolut is half this price. With the arrival of PSD2, we can expect to see more third-party partnerships focusing on low price services for customers in mobile apps. It is worth keeping an eye out for financial service companies that are looking to expand beyond their own core services. In February, Revolut introduced its ‘Rev Me’ feature. Customers can now request money from people that don’t have Revolut by sending a Rev Me link to a contact. The contact then needs to select the link and pay instantly using a debit card, removing the need to send card details. Customers can request between £1 and £250 in nine currencies. This is similar to competitor’s features such as Monzo.me. This is an important feature for digital banks to integrate into their apps, as it makes it much easier for users to split bills and request payments from friends. Also in February, Revolut introduced Price Alerts to its app. Price Alerts allow users to receive a notification whenever the price of a currency goes above or below a certain point. This is useful for customers who may want to convert currencies when the price is most beneficial, or for tracking the cryptocurrency markets. In March, Revolut became the first of the challenger banks to break even for the first time. Revolut now has 1.5 million accounts, this is a 50% increase in the last two months. This is significant as one of the major issues facing digital banks is their profitability and scalability. Revolut’s success has shown that there is the potential for a profitable future. Revolut introduced its ‘Proximity payments’ feature in March. This new feature allows users to select ‘people near me’ under the ‘payments’ tab to pay people in their proximity. This new feature extended Revolut’s payment offerings, making it simpler for users to split costs and quickly transfer money to friends in their vicinity. This feature is not currently provided by any other challenger bank and displays Revolut’s desire to differentiate itself from its competitors by providing new and interesting functionalities. Also in March, Revolut launched its EUR direct debits for European customers. This means that customers will now be able to automate bill payments. Existing functionality already allows European customers to transfer money via SEPA and Swift. However, this new feature will help people easily automate payments from their account on agreed dates to pay for bills, subscription services and more. 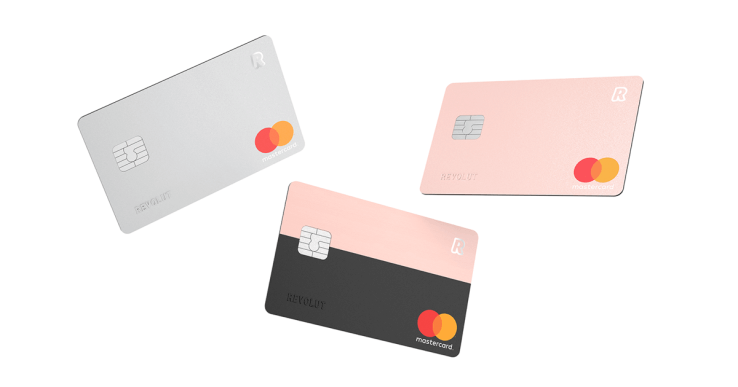 In March, Revolut launched disposable virtual cards for its Premium customers. This feature is aimed at making online payments safer and tackling fraud. Disposable Virtual Cards work by providing the customer with new card details that can only be used for individual transactions before being destroyed, generating a new one every time an online purchase is made. This adds a layer of security that means users do not need to compromise their card details when shopping online. This feature is currently only available for Revolut Premium customers for up to five payments per day. Revolut is using the $66m funding from its investment round in July 2017 to add new features including an integrated investment platform, from which users will be able to buy stocks and bonds. The bank also recently introduced cryptocurrencies to its app, allowing users to hold, exchange, spend and transfer digital currencies. It was also reported that Revolut was partnering with ETFmatic to provide an investment platform proposition within the app. Revolut also has ambitions to not only expand in Europe but also to launch in Asia and North America over the coming year. While legitimate questions still persist around the scalability of FinTech providers, Revolut is pushing boundaries as it continues to work towards a full complement of banking products and services. FinTech challenger propositions have generally focused on redefining specific core elements of day-to-day banking, leading to a sense of fragmentation that has inhibited scalability. Challengers such as Revolut and Starling have shown that partnerships can help address this issue and make their offerings more relevant to everyday banking customers. In the post-PSD2 environment of open banking, Mapa expects that such partnerships will quickly address the fragmentation issue, redefining the role of FinTech providers. The benefits of using Revolut like a current account are clear. As the company says, ‘Once funded, the Revolut account is like having a local bank account wherever you are. You can spend or transfer money around the globe fee-free with the real exchange rate and take advantage of other features like blocking your card temporarily, splitting bills instantly with your phone contacts and real-time payment notifications’. But what is the app like? Is it providing a customer experience to compete with the big incumbents? Who else is improving the mobile experience when it comes to product discovery and applications? Check out our full Mobile Banking Monitor to find out. For more information on UK Challenger Banks, download our free report.